When creating a WPF application, you should avoid using bitmaps for images in your application but instead use images drawn using vector graphics. You can use a tool like Microsoft Expression Design 4 to generate your images. 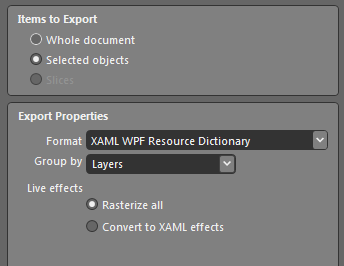 You can then export these images as XAML, so that you can use them directly in a WPF application. I’m using Blend as a designer. I created a simple button interface that slides into the screen. I want to send the xaml code to the developers, from what I understand they can open this code within Visual Studio and see what I’ve designed as well as editing the code to fit their needs. How do I do this? Do I just copy the xaml code?